Posted in Cute Filipinas, FEATURED, THE ROOSTER CROWS AT 4AM! Here’s more fine filipinas that I observed at the Manggahan Festival held in the sweet mango province of the Philippines this past April. The young lady pictured below gladly posed for this photo as she clung to her cute baby daughter. Aside from a few shy South Koreans I met during a recent visit to Raymen Beach Resort, I’ve never had anyone refuse my photo requests. I always approach everyone politely, pour on my considerable charm (remember, this is my website) and explain I have an asawa. Most filipinos smile and let me snap their picture with my wife’s Sony CyberShot Digital Camera. The pretty pinay featured in the next two photos was involved in the ABS-CBN Kapamilya Karavan 2013 that was held Sunday afternoon at 3 pm on April 14, 2013, the first official day of the Manggahan Festival. The noise from the stage show was deafening at times. My American expat friend, The Tom Cat, and I, had difficulty hearing each over as we quaffed a “few” bottles of San Miguel Pale Pilsen. We must have heard the official Manggahan Festival theme song around a thousand times. It was hotter than the skin tight leotards the cute Filipina emcee was wearing, but we sat in the shade underneath Lisa’s Talaban and managed to catch a breeze from one of the few fans found at the mango party. Would be great if misting fans could be set up throughout the festival grounds, but I doubt that’s in the budget. With the mango mash being held in April, one of the hottest summer months, a cooling station could provide some relief from the heat. Even after four summers as an American expat living in the Philippines, I still find the summer months the most difficult to deal with weather wise. I’m ready for the rainy season which should be starting soon. 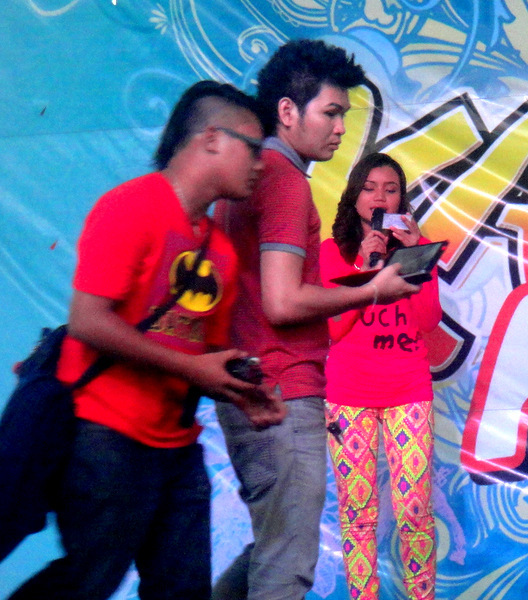 Don’t know the lovely lady’s name in the colorful leggings pictured above, but believe she was from the ABS CBN Iloilo City television station. I sincerely do not know how some of these pretty pinays manage to get into the tight-fitting jeans, leggings and other form-fitting outfits that I’ve admittedly noticed since moving to the Philippines almost four years ago. During my teen years I could have poured myself into a straight leg pair of regular fitting Levi’s, but with my advanced age, 61, I’ve put on quite a few pounds over the decades and wear loose fit Levis now. If not for my daily early morning walking regimen around our subdivision, I would probably balloon up like Jerry Lewis on steroids. 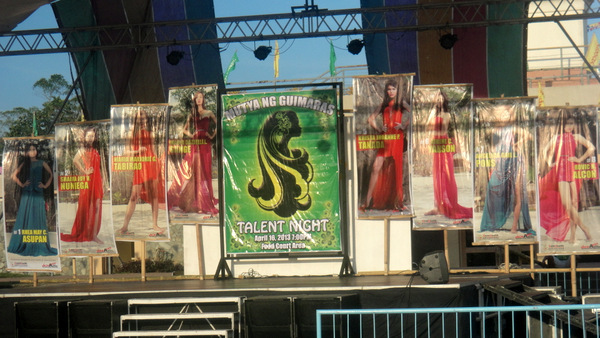 Here’s a shot of the posters for the Mutya Ng Guimaras, Pearl of Guimaras, Talent Show contestants. The talent show was held during the Manggahan Festival on Tuesday, April 16, 2013. One of my asawa’s countless relatives from the mango province, Maria Daziella Lazaro Gange, was in the group of eight ladies vying for the title in the beauty contest portion of the competition which was held later that week, on Friday April 19. My wife and I went to the finals of this competition two years and covered it in this post. My wife has never met Maria Daziella L. Gange from San Lorenzo but believes they are probably related since they share the same family name. When I jokingly state on this website that my spouse is related to half the people on this province, I’m probably not exaggerating by much. It seems we’re always running into some relative on the pump boat, jeepney, or the local market whenever we visit our former home. If you encounter a relative (or friend) on a jeepney or boat, expect to pay their fare. That’s a custom my wife faithfully observes. Here’s a large poster that was displayed on the festival grounds at a kiosk set up by the town of San Lorenzo where the Filipina beauty resides. 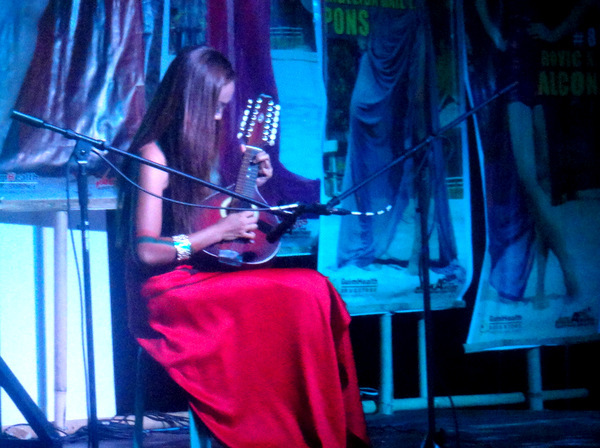 Maria Daziella played this musical instrument for her portion of the talent night. Each person was allowed three minutes for their performance and would be penalized if they went over the time limit. The entire talent show only lasted 30 minutes. Have no clue as to who won the talent competition or who ended up as the winner of the overall beauty competition on Friday night. My asawa and I left on Thursday morning. The original plan was to return to our home in Iloilo on Saturday and attend the Mutya Ng Guimaras contest on Friday evening. But after four days, I was anxious to return to our domicile. There’s only so much partying a 61-year-old geezer like me can handle. The pretty pinay featured above had a dance partner. The contestants were not required to do their act solo as my wife’s relative, and the young lady depicted below, did. Don’t remember the song the lovely Filipina warbled. This was back in April. I can barely remember what I had for breakfast this morning. And please don’t ask me what day of the week it is. Since moving to the Philippines, I have to look at a calendar to determine that. Every day is the weekend when you’re retired. But the excitement level went up (as did my blood pressure) when this dynamic Filipina went on stage to do her dance number with some energetic pinoys. She put on quite a show and in my opinion, should have been one of the favorites to win the talent portion of the competition. 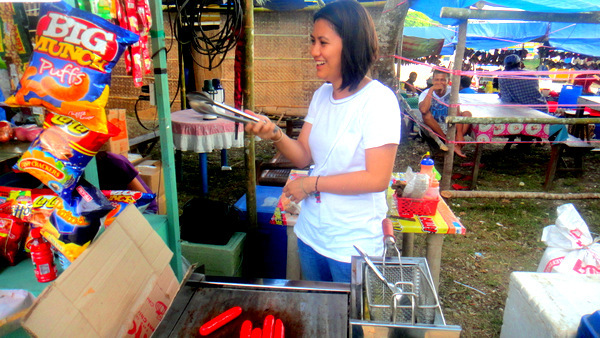 The next day I spoke to this young lady operating a hot dog stand at the Manggahan Festival. Pleasant girl who also happened to be related to my spouse. Somehow I wasn’t surprised. I’ll close this segment with a cute Filipina that had her back to me. She was checking out the hot dog stands which I avoid. The red dye color they inject into the most of the hot dog products in the Philippines is not one bit appealing to me. But a pretty pinay with nice legs? That’s a different story. Too much party for an old goat like me Dave… Just stay at home in front of the fan. Sometimes we go to the mall and watch a movie. The air-con is nice on a hot summer day. The last big event I went to was a trip to Davao City to have lunch at Gerry’s Grill. I stay at home most of the time, too, Gary, though I do have a trip planned to Guimaras with some expat friends the first week of June. I’ll be reporting on that later. My expat friend in Guimaras, The Tom Cat, will probably bring his camera on the planned Guimaras adventure. That’s good since we’ll probably be quaffing a few brews into the wee hours. I’m usually asleep by 8 pm and get up from 2:15 am-3:30 am and do my morning walk. So staying up late is going to be a challenge for this old geezer, but I’ll manage. Tom is a young buck of 52, I believe, so he’ll help keep me awake. Glad you enjoyed the photos, Gary, and as usual, thanks for the support. Thanks for your latest post on your website, I greatly enjoy your stories and the pictures of pretty pinays. I am planning to retire in mid-2018 and I may move to Iloilo instead of Cebu, as Cebu is becoming too crowded and expensive. I agree with you %100 on the hotdogs, the artificial coloring is definitely something to worry about. I joke with people that you can use the hotdogs from Philippines as markers at the airport, the pilots can see them from miles away as their bright color can illuminate any field they are placed on. I don’t eat them at all when I go to Cebu. You’re quite welcome, Marty, thanks for the positive feedback. I’ve been to Cebu a couple of times. Nice place, but I agree with you, too crowded and expensive for me. Iloilo City is just the right size for us. It has plenty of shopping, good hospitals and other services, but isn’t that difficult to get around in. More mega malls are in the works. Glad you enjoyed the post, Eric. There are no words that can adequately describe how it feels to be retired and living in the Philippines. Gary Wigle and I are always touting the Tourism Dept.’s “it’s more fun in the Philippines,” slogan because, at least from this American expat’s view, it’s true. I absolutely love getting out and mingling with the locals and seeing all the sights and sounds. Looking forward to your arrival here. That cold one is still waiting for you, Eric, come on over.